hiPS-HSPCs possess molecules that mediate extravasation. (A) Representative histograms showing expression of CXCR4 and CD44 on hiPS-HSPCs and control RPMI8402 cells. 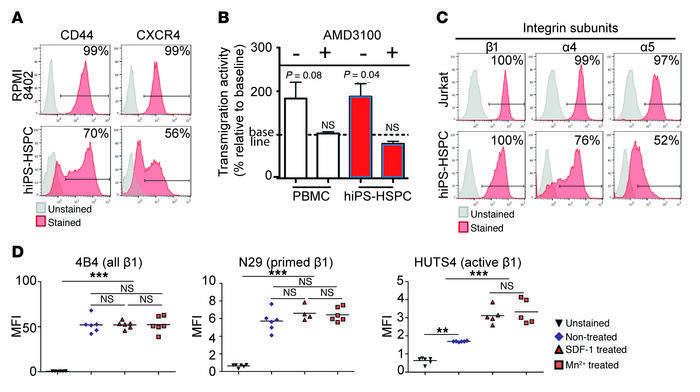 (B) Normalized transmigration activity of hiPS-HSPCs and control human PBMCs in response to SDF-1. CXCR4 antagonist (AMD3100) used to confirm migration was CXCR4-mediated. n = 3. (C) Representative histograms showing expression of β1, α4, α5 integrin subunits on hiPS-HSPCs and Jurkat control cells. (D) β1 integrin activation status of hiPS-HSPCs stimulated with SDF-1 or MnCl2 from multiple experiments. 4B4, all β1 conformations; N29, primed β1 conformation; HUTS4, active β1 conformation. n = 4–6; **P < 0.01, ***P < 0.001; NS, not significant by 1-way ANOVA with Tukey’s HSD test. Error bars indicate SEM.